I am not a fan of winter. If I had my way, it would be summer year round where I live. What I do love to do most on a cold winter day is whip up a batch of hot cocoa and settle in with a good book. I’ve had such a sweet tooth lately, but with the really hot summer we are having, even just thinking about sipping a cup of hot chocolate is almost unbearable. However, if you are a regular reader, you know that I love me some drink recipes, and where there is a will, there’s a way. I have to be careful how often I make these because they are SUPER YUMMY! I could drink them all day! Place the white chocolate pieces and the half and half into a microwave safe bowl. Heat for 1 minute, stopping to stir half way through. Continue to heat until melted and smooth. Add the hot chocolate mix and sugar, stirring constantly until thoroughly blended. Remove from heat and slowly add 1/2 cup of the milk and stir until smooth. Cool to room temperature. In a blender place the remaining cup of milk, the room temperature chocolate mixture, and the ice. Blend on high speed until smooth. 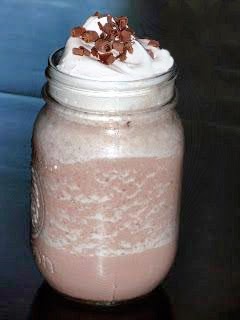 Pour into a cup and top with homemade whipped cream and chocolate shavings. ALSO- I am so excited to be the “Featured Friend of the Week” over at Create With Joy! She featured my Strawberry Cheesecake Shake this week! Woo Hoo! Be sure to stop over at her Friendship Friday Hop and link up or just check out some of the awesome post links! Thanks so much Joy! This is certainly a MUST TRY! Yum!!!! Congrats Theresa for being featured on Friendship Friday!!! It's because your awesome! I prefer it to be summer all year too...that's why I moved to St. George :-). And ditto to Paula J's comment congrats on the Friendship Friday feature. I'll have to check it out! Really Brandi, you MUST try this recipe. The first time I had it I really thought of keeping the whole batch to myself. It's that good! That's what my husband told me when I tried to pass some on to him. He eventually had a small glass and had to restrain himself from having more. Looks so yummy, thank you for sharing. I live in Arizona and will be giving it a whirl as we are hovering around 103-104. I'm a new follower. oh my gosh...that looks fabulous!! I LOVE hot chocolate but have never made it frozen! I will have to give this a try - it sounds delicious! We were just talking about hot chocolate tonight (because it's getting chilly outside). I'm with you on the cold weather thing, I lived in FL. most of my adult life and it's really hard to get used to the whole 'up north' thing (where we live now), but I am starting to really enjoy the seasons. Maybe someday I'll love winter, who knows? (crossing my fingers and toes it happens). Wahoo! This sounds delicious and refreshing! I ♥ white chocolate! I am late but wow! I have been seeing this all over (not the recipe just the drink). I have to make this like yesterday! I know my kids will enjoy it so much. Not only will your kids love it, you will enjoy it too Dharper! Oh my gosh... how did I miss this post. It must have been when I was on vacation. This looks so good. Pinning this recipe for a cold January night. Sheila, you don't have to wait for a cold January night to enjoy this! It's a cold drink, so you can definitely enjoy it on warm days too :) Hope you like it! This looks so good. I'll have to try it very soon. Thanks for the recipe.